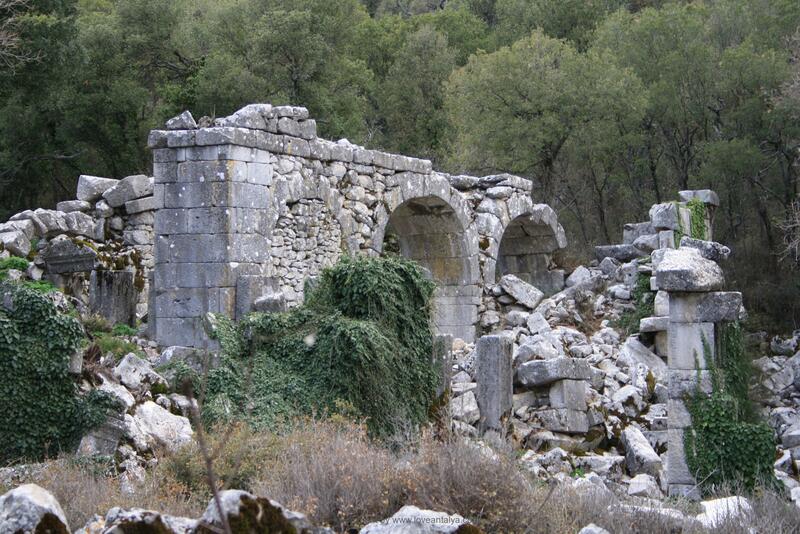 Perhaps you have read the first post about our blogger trip to Termessos ruins part 1? 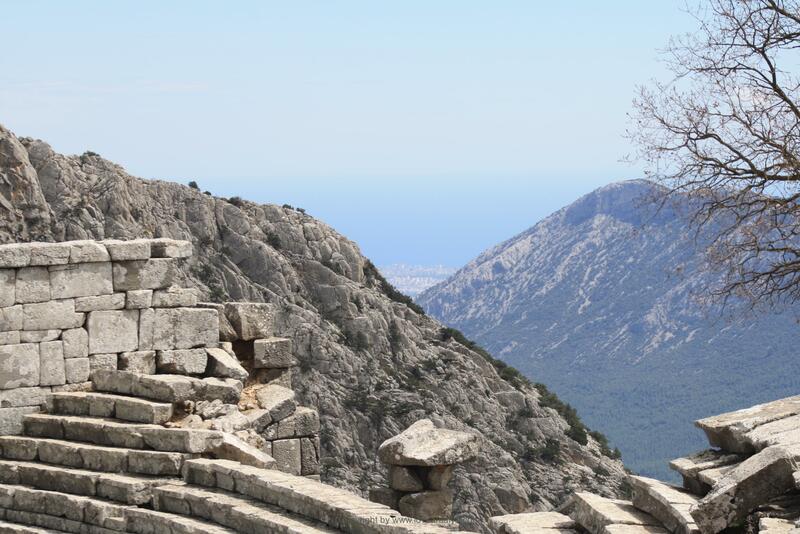 Here you got our story about our blog meeting, the trip up to the mountain and the more practical information about Termessos and the National Park with opening hours, prices etc. 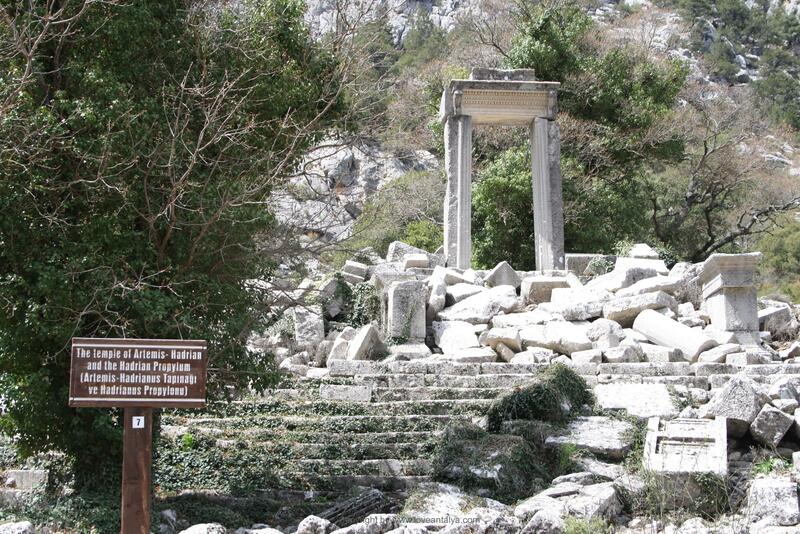 Already on the way up to Termessos, you realize, that it is something very special. 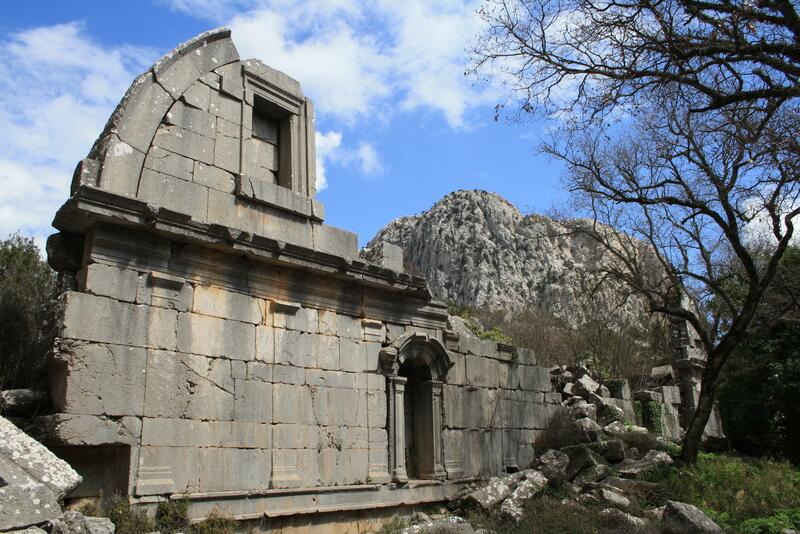 Partly due to the impressive mountains and the impossible terrain, and partly because there are remains of several ancient buildings along the 9 km. road up the mountain. At the grand square you will be met by the gate of the first temple – built in honor of Artemis (Greek Goddess) and Hadrian (who also built the 3 gates into Antalya’s old town). Only the gate is still standing – the rest of the building is unfortunately in complete ruins. It looks like a Giant has thrown the stones around (and it’s nearly the truth since 2 big earthquakes officially destroyed the city). All around you can see remains of tombs and water cisterns – also unbelievable far up the cliffs. Let it be said at once. 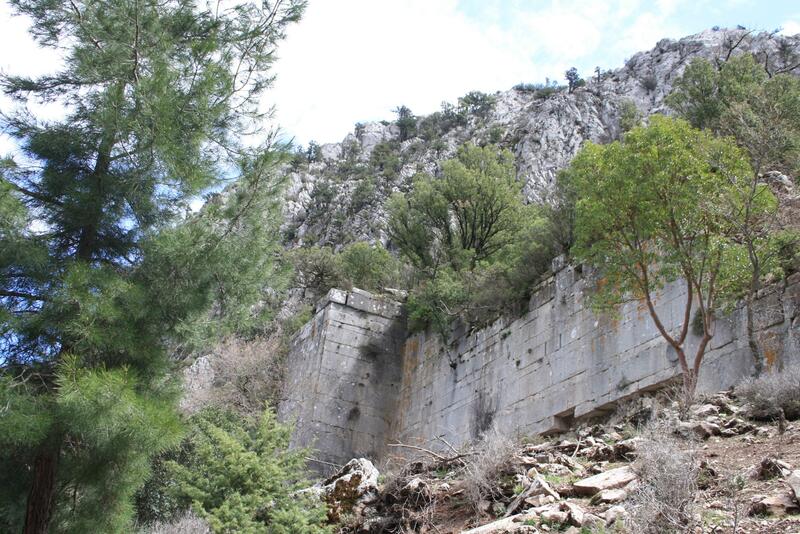 A trip to Termessos requires really good footwear, water, patience and above all an okay physic. It goes UP – very much up. We also had great pleasure by filling our sugar potatoes (ie chocolate), when we reached the top. The journey up required it (some kind of excuse). At least we got a challenge and got the day’s training done by walking up the hillside. According to the GPS, we had gone up to the 28th floor !! The trail is twisted and uneven and filled with stones. Fortunately, we only had one minor accident, but you have to be careful. Fortunately, several small benches are located, very strategic – on the narrow path up. All had a spectacular and beautiful view. The entire settlement houses many different buildings spread over a huge area. From the first outer city walls and the Hadrian temple down the parking lot to countless tombs, 5 temples, huge water cisterns, aqueducts, a gymnasium, a trading venue, the inner city walls, a huge impressive hammam / bathing facility and one even more impressive theater further up the mountain. The tombs were only for the city’s most important men – other inhabitants were relegated to less pompous places. Unfortunately, we didn’t see the entire place as the weather threatened to send rainbreaks over us every minute. But something that impressed me the most was probably the big hamam buildin. A huge majestic mastodont in the middle of it all. Although it is by no means excavated and almost overgrown with thicket, you could clearly sense how great it was and how beautiful it must have been. We climbed a little around the ruins and could see, that under the building there was also an equally large lower floor. I think it’s ever so impressive, that you could build something like that – and even so high up in the mountains. The theory is, that there already then were slaves to build and tow the large marble and travertine stones from the nearby quarries. Something, the Romans that later ruled in the area, were so notorious for. Finally, if you get to the great beautiful theater, you can not avoid being impressed. Both because of yourself and your performance as a mountain goat but also over the breathtaking panoramic mountain views, that simply takes the breath away. On a good day (and we had one) you can see approx. 35 km down to Antalya, see the city and the Mediterranean sea between two mountain tops. That was quite wild. If it was Zeus, who heard us, I do not know (but I think so, because we asked him on our way up for good weather). Even though the rain had threatened the entire trip al the way from Antalya, the sun broke out just as we got up to the theater. Can you feel more lucky? The original inhabitants called themselves “Solymi” after the ancient god Solymeus – also identified as Zeus (several coins have been found on the site with images of Zeus). So it was not entirely wrong, that he might have talked with the weather gods. 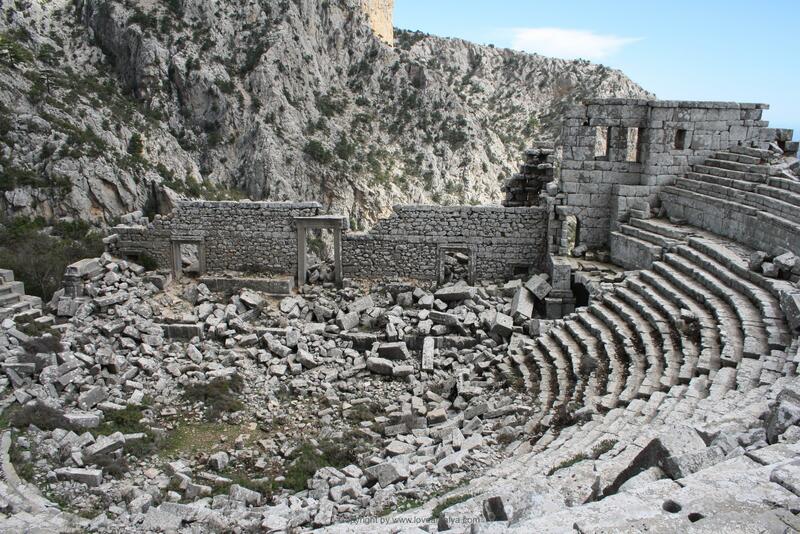 The theater itself is one of the best preserved ancient theaters in the world (like Aspendos located on the other side of Antalya). There was room for approx. 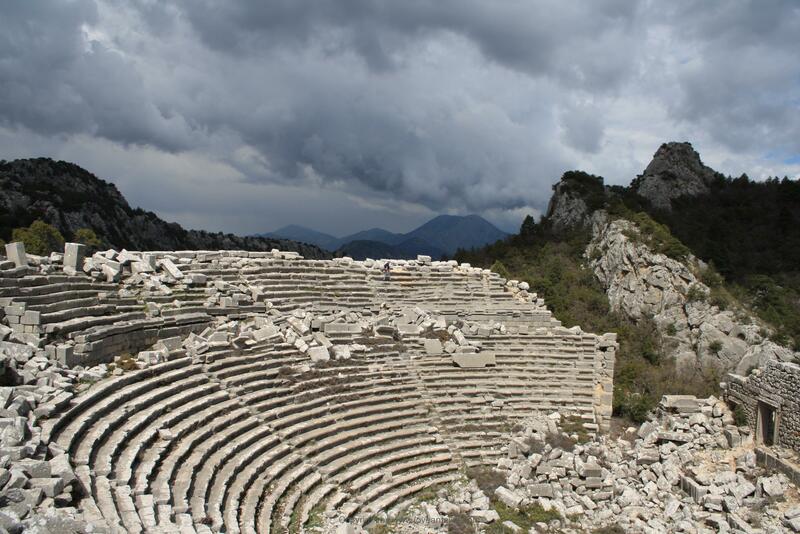 4200 spectators, who could probably watch animal battles and hear the recitation of poems and remarks of Greek mythology. It was the Greek hero Bellophon who, according to the Iliad by Homer, defeated Termessos by riding the winged horse Pegasus across the city and threw large rocks down on the city, until the inhabitants surrendered. But the theater is something so impressive and magnificent, so one should really give priority to seeing it. Think we could have used more time with just exploring this place and walking up and down the well-preserved stairs. The buildings behind the theater have vanished, so if you look out of the stage window, you look straight down into the abyss. So scaring!! If you have a lunch box with you, the theater is the place to sit and enjoy it. We were slightly annoyed, that we hadn’t taken one with us (but chocolate made it almost as good). Here you could just spend an hour to sit and soak up the landscape and the fresh air. Mindfulness is might be called. Behind the theater is the big marketplace – there is not much to see other than a big green area, where there have been stalls, performers, etc. It must have been a breathtaking sight. On the trip around the terrain, we also came to some big water reservoir, fortunately covered with a solid iron grill. In one place there were 5 holes in the ground, where huge cavities were built downstairs with brick walls and with transverse beams as stiffening (or perhaps as a form of wheel to draw the water up. Atleast that was our theory). It was a little creepy to look into them, but one could not help being curious and feeling a little bit like Indiana Jones, when exploring. Need I say that the trip down went a little easier, than the trip up (apart from a single tumble stunt). We were ever so tired, when we finally reached our car. However, no more tired than we – when we were still on our way, decided to visit the nearby Karain Grotto, which is actually a drip cave. I’ll write about this another time.